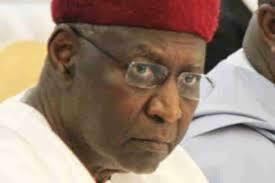 A national newspaper had published a story in which a petitioner, Bako Waziri Kyari, who claimed to be a nephew to the chief of staff, alleged that Mr. Kyari collected N29.9m from him in order to facilitate the award of a contract. The petitioner, had said on an Abuja-based Human Rights Radio 101.1FM in Abuja, that Mr. Kyari and Sani Ado, whom he claimed worked with the Bureau of Public Procurement, allegedly collected amount from him. “The Presidency takes strong offence to the improbable and outlandish publication by Punch Newspaper today (Saturday) in a dig at presidential aide Abba Kyari who was alleged to have collected a 29-million-naira bribe for the awarding of a contract,” Mr. Shehu said in a statement. “We equally note that the supply of 15 Hilux vehicles for the Presidency was an unlikely contract to have been awarded, as it did not exist anywhere in the 2016 and 2017 budgets,” it further said. The Presidency takes strong offence to the improbable and outlandish publication by Punch Newspaper today (Saturday) in a dig at presidential aide Abba Kyari who was alleged to have collected a 29-million-naira bribe for the awarding of a contract.